Sponsored by AM Mark Isherwood the event attracted 60+ attendees and a great deal of discussion, interest and new ideas were generated. AM Mark Isherwood himself launched the event with a concise and clear overview of 3SC, our work and the report. Andrea Wayman of Elite employment followed with a partnership view of our work and how results are obtained in practice. Andrea outlined the strengths of our sector; “We know our communities, we know what they need, what they want and we strive for their best outcomes”. “The needs of people using public sector services are best met by local, passionate and knowledgeable third sector organisations… The time is right for the public sector to change how they work with the third sector and despite current legislation, there is a disconnect between government policy commitments and activity on the ground. “We should be encouraging collaboration and partnership not just competition… Let’s get the new wellbeing of future generations act embedded on the ground… Closing the gap between what policy says and what the public sector actually does. The 3SC report; The crisis in public sector contracting and how to cure it: a Wales perspective. 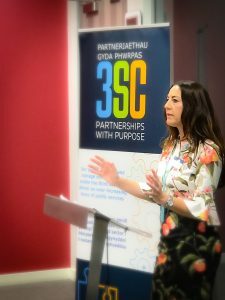 3SC work to bring the third and voluntary sector into partnership with the public sector to deliver quality, local and expert solutions.